They’re referring to a scene in the Father Ted Christmas special where a priest claiming to be an old friend of Ted visits the parochial house. Ted doesn’t know who he is, but pretends he does; the problem is he doesn’t know this priest’s name. 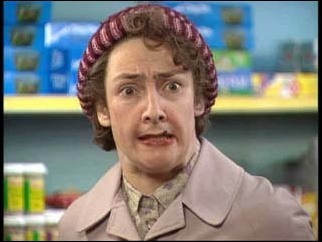 Ted encourages Mrs Doyle to guess what it might be. She launches into a long list of names of mounting absurdity. Father Chewie Louis, Father Stig Bubblecard, Father Peewee Stairmaster, and lots more until she finally hits the correct name of Todd Unctuous. It’s very funny. Whenever this comes up, I’m always quick to point out that it’s not a coincidence. Father Andy Riley is me. Me and my writing partner Kevin Cecil worked with Graham and Arthur, the writers of Ted, a year or two before. While they were writing the later series of Ted, we were in the habit of dropping by their office at Talkback productions whenever we were in the building, to drink their tea and talk about comics and stuff. We probably did it on the day they were writing that scene, which is why we got on Mrs Doyle’s list. Kevin was the third name on the list but sadly got chopped out in the edit. He’s there in the Father Ted script book though. So, naturally, this is my favourite bit of Father Ted. While walking by himself, the unnamed protagonist hears a small voice inside his head, which he deduces to be the voice of his soul. He wonders who his soul might have occupied before he had it. The honourable Alex O’ Brannigan, Bart. Mr John P. De Salis, M. A. His soul then interrupts to say that Signor Beniamino Bari is the right one. I’m pretty certain this passage is a big influence on Mrs Doyle’s speech. The “long list of funny Irish names which may or may not apply to an individual” has a great pedigree. More recently, I discovered that it goes back a whole lot further than I suspected. When reading a book of Irish myths and Legends, I found what I believe to be the ancient ancestor of the Mrs Doyle/Todd Unctuous scene. It’s a passage in “The Destruction of Da Derga’s Hostel,” a tale found in one of the earliest cycles of the Irish myths. Conair, the hero of the tale, is waiting to besiege a building full of fearsome warriors. A woman comes up to him and prophesy is that he will not survive. Conare asks for her name. “A name with nothing to spare, that,” said Conare. “Indeed, I have many other names,” she said. “What are they?” Asked Conare. “Not a difficult that,” she replied. “Samuin, Sinand, Sesclend, Sodb, Saiglend, Samlocht, Caill, Coll, Dichoem, Dichuill, Dichim, Dichuimne, Dichuinne, Darne, Darine, Der Uane Egem, Agam, Ethamne, Gnim, Cluche, Cethardam, Nith, Nemuin, Noenden, Badb, Blosic, Bloar, Uaret, Mede, Mod.” And she recited these in one breath,, and standing on one foot, at the entrance to the house. Irish myths aren’t like the Bible. They’re more like the Greek myths: the gods are fallible and they mingle with men. They certainly don’t display superior morality to the mortals. And, I’d argue, the legends have an innate sense of humour about them; this bit is an example. You could claim that the speaking in one breath and standing on one leg refers to an important ritual whose meaning is now lost.. But I think the humour is intentional. And just look at it – not precisely the same formula as in The Third Policeman and Father Ted, but still a long list of possible names, all referring to one person. Flann O’Brien knew a lot about the Irish sagas. his first book (At Swim Two Birds) one of the main characters is Finn Mac Cool, a hero from the old stories. He would have known The Destruction of Da Derga’s Hostel. So I’m going to stick my neck out here. I contend that Mrs Doyle is a bit in A Christmassy Ted has a comic lineage stretching back more than 1000 years into the misty beginnings of Irish history. If anyone knows a comic riff which has been around longer, I’d love to know. PS – I think I’d better mention that I haven’t tried this theory out on Graham or Arthur yet. Let’s see if they disagree.